A proxy server is an application or system that acts as an intermediary between your computer and the Internet. Enabling this service can cause problems in accessing Internet websites because the proxy server settings have been configured. This article will guide you on how to disable proxy settings on Mozilla Firefox®. 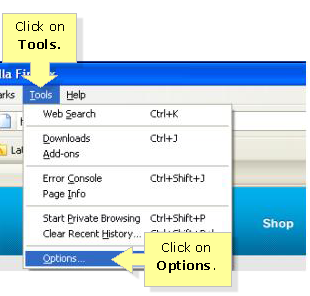 On the Mozilla Firefox window, click on Tools then click Options. Click the Network tab then click on the Settings button. On the Connection Settings window, ensure that the No Proxy option is selected. Then, click on the OK button to apply the changes.